The Stepper Dialog allows carefully testing compiled code by interrupting execution at selected forms in the original source code and at macroexpansions of the code, allowing state to be examined at each stop point. The illustration shows the Stepper Dialog stepping through the fact function, which calculates a the factorial of its argument. The definition of fact is shown as described below. The dialog displays the original lisp source code for a function or method that is being stepped through, highlighting the form at which the stepper is stopped. Button widgets allow proceding in various ways each time execution has been interrupted. 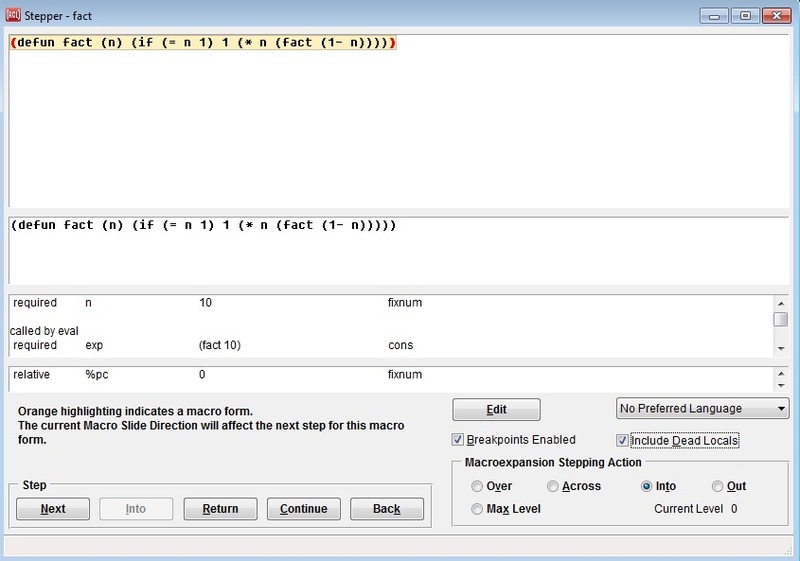 The dialog also displays macroexpanded forms and the values of arguments and local variables, updated after each step. The IDE's code editor can be invoked at any time on the code being stepped through. The dialog is implemented on top of the base lisp's stepping facility, which also has a simpler textual interface that can be used in a lisp listener. See The Lisp DeBug (ldb) stepper and The source stepper, both in debugging.htm. Show the Stepper Dialog with the menu bar command Run | Stepper Dialog. While the Stepper Dialog is present, use IDE menu bar commands to compile and load some code to test. These commands include Compile and Load (for a file), Tools | Full Compile (for the current project), and Tools | Incremental Compile (for a single definition in the editor). Using an IDE compilation command while the Stepper Dialog is present ensures that the necessary debugging information is available for doing source-level stepping. One caveat: Compile and Load does not recompile the code if there is an up-to-date fasl file. To ensure recompilation, you could use Compile followed by Load. Or first save a buffer in the editor to ensure that the fasl is no longer newer, and then use Compile and Load. Status bar messages will indicate when compilation was really done. Advanced explanation: The actual requirement is for particular compiler switches to be enabled when the tested code is compiled. This is done automatically when using IDE commands while the Stepper Dialog is present, but you could alternately manage the compiler switch variables yourself. All of the needed switches will be true if the general debug optimization level is 3, as with (declaim (optimize (debug 3))). The individual switch variables include save-source-level-debug-info-switch for source-level stepping, along with save-arglist-switch, save-local-names-switch, and save-local-scopes-switch in order to display local variable names and whether each variable is currently "dead" and so on. Add breakpoints to one or more functions or methods by using the Run | Set Breakpoint menu command. To do this, first place the text cursor onto the name of a function in the editor (or elsewhere in the IDE) and then invoke the menu command. A message in the status bar at the bottom of the IDE will mention that a breakpoint has been added. The keyboard shortcut for the command is F7, so you could for example begin typing a call to a test function in the Debug Window, pressing F7 just after typing the name of the function to breakpoint it, and then typing the rest of the expression and evaluating it. If the selected function name is a generic function, then a pop-up menu will appear where you can select the particular method to breakpoint. The special All choice at the top of the menu will breakpoint all methods. Another way to breakpoint a particular method is to use the Definitions dialog on a generic function, then select one of its methods in the dialog's list and invoke Run | Set Breakpoint. With the Stepper Dialog still present, run some test code that calls one of the breakpointed functions. A break should occur and bring the stepper dialog to the front with information about the function. You are now ready to step through the definition that is shown, as described below. After the setup above, if you see the Stepper Dialog with a lisp form in the second pane from the top, then you have successfully initiated source-level stepping, and can proceed stepping through the definition that's shown. If you instead see an assembly language form in the second pane, then review the instructions above for setting up source-level stepping. The three content panes are unlabeled to save space, due to the typically large amount of content. Here are brief descriptions for now: The uppermost pane of the dialog (the Definition Pane) shows the entire definition that is being stepped through. The second pane from the top (the Form Pane) shows the form at which the stepper is currently stopped. The third pane (the Stack Pane) shows the arguments and local variables of the function that is being stepped through. Step through the displayed function by pressing any of the four buttons at the lower left of the Stepper Dialog (inside the Step box), such as the Next button to "step to the next form". For stepping quickly, it's handy to use the keyboard shortcuts for the buttons, such as alt-N to Step Next. The Step Into button will be available only when the highlighted form is a function call. It will step into the function that is called by the highlighted form, and then stop at the first form in that function. The new function will then be displayed in the Definition Pane, replacing the one that you were stepping through. You can then proceed to step through the new function. On returning from the inner function, the Stepper Dialog will continue stepping through the outer function. Step Into is most suitable when the highlighted form in the Definition Pane has a green background, which means that the necessary debugging information is available for source-level stepping through the function that will be called. The Return button will proceed to execute the displayed function or method without further incremental stops, allowing it to return normally. If the current function was called by another function that was also being stepped, then stepping will then continue through the calling function. The Continue button will proceed with normal code execution, allowing it to complete. This is recommended whenever you're done stepping for now; otherwise the listener process will remain stopped at a step, which might interfere with other IDE commands. For example, while stopped at a step, the Tools | Incremental Evaluation command would queue up the new evaluation as usual until the current one has returned, and it may not be clear why the evaluation is not being done. The listener itself may be unresponsive while stopped at a step, unless you generate a fresh prompt with View | Debug Window menu command (the keyboard shortcut is F9). Clarification: The bullets above for the four stepping buttons describe how the stepper will stop at "temporary breakpoints" that the stepper sets itself. In addition, the stepper will always stop at "user breakpoints" that you have set yourself (until you disable or delete the breakpoints). So you may need to use the Continue button a number of times to stop at all user breakpoints before stepping finally completes. Or to exit all stepping as quickly as possible, use Run | Remove All Breakpoints and then press the Continue button a single time. In addition to setting breakpoints at the entrance to functions by using Run | Set Breakpoint, you can set breakpoints inside the function that is being stepped through now. To do this, move the mouse over the Definition Pane to highlight the breakpointable forms in the definition. When the desired form is highlighted with a blue border, left-click to breakpoint that form. The parentheses on the ends of the form will turn red to indicate that there is a breakpoint on that form. Left-clicking a form that is already breakpointed will unbreakpoint that form. Or right-click the form and select "Breakpoint" or "Unbreakpoint" from the pop-up menu that appears. It can be useful to add a breakpoint somewhere past the highlighted form in the Definition Pane, and then to press the Continue button to proceed to that point. That's faster than stopping at all of the forms in between. You can set breakpoints inside a definition without first breakpointing the entrance to the function by using Run | Show Definition in Stepper Dialog. That command will display a definition in the Stepper Dialog even though it is not being executed and stepped through (assuming that the function has been compiled for source-level debugging -- see The source stepper in debugging.htm). You can then set breakpoints inside the definition before running code that will call the function and stop at those breakpoints. When doing a step results in all of the stepper dialog panes turning blank and remaining so, it means that the evaluation has proceded without hitting another breakpoint. The code execution might be busy, but typically it will have completed. If the current test was initiated by evaluating a form in a listener or in the editor, you may want to check the listener at this time to see what final values were returned. If you come to a place where you would like to edit the real source code, such as to fix a bug, then press the Edit button to show the displayed function or method in the IDE's source code editor. The code at the current step will be selected in the editor just as it is in the Definition Pane, and the selection will be updated in the editor during further stepping as long as that editor pane is left open. If you would like to temporarily execute the test code normally without interruption, toggle the Breakpoints Enabled check box off to disable the currently defined breakpoints. Toggle it back on later to for another stepping test. If you toggle the check box off while stopped at a step, it will abort from the evaluation that is being stepped through. Note: Toggling the Breakpoints Enabled check-box while stopped at a step may not be working properly at this time, and may lead to a confused state. When you are done stepping for the moment, it is recommended that you press the Continue button a number of times as needed until all stepping has completed, to let the process unwind from the code that was being stepped through. Once that has happened, toggling off the Breakpoints Enabled check box will avoid triggering the still-active breakpoints for now. And when you are completely done testing the current set of breakpoints, Run | Remove All Breakpoints will delete all user breakpoints. The Definition Pane (at the top of the dialog) shows the source code for the function or method that's currently being stepped through. This is a copy of the real source code text, complete with comments and original line breaks. The form at which the stepper is currently stopped will be highlighted with a different background color. The meaning of the various colors is covered in a separate section below. Red parentheses are drawn around any breakpointed forms. When the mouse moves over a local variable in the definition pane, the current value of the variable will now be shown in the message widget. This avoids often needing to scroll down to that variable in the list of all arguments and local variables. The breakpointable form under the mouse (if any) in the Definition Pane will have a blue border drawn around it; this is the "selected object" in the pane to which commands on the right-button shortcut menu will be applied. Even keyboard shortcuts from the IDE's menu bar can be applied to the highlighted form. If the mouse is not inside the Definition Pane, then the form at which the stepper is stopped is the selected object to which IDE commands will be applied. The Form Pane (second from the top) shows just the form at which the stepper is currently stopped. This form would be executed by a subsequent Step Next. Sometimes this is a form in the original source code, and is the same as the highlighted form in the Definition Pane, and at other times it is all or part of a macroexpansion. This form is shown pretty-printed by the lisp printer, and therefore is typically more compact than the highlighted form in the Definition Pane even when they are the same form. You could click on a symbol in this pane and then apply IDE menu bar commands to it, for example, as in the editor. The Stack Pane (third from the top) lists the arguments and local variables of the function that is being stepped through, followed by the arguments to the function that called the function being stepped, and then by the arguments to the next calling function. When a new function is first stepped into, the arguments are listed first, whereas on subsequent steps the local variables are listed first; this is done so that the most pertinent information at each step is more likely to be visible when the Stack Pane remains scrolled to the top. A new variable value will not be updated in this list if it is being held in a register for efficiency, rather than being stored in the variable's official location on the stack. You may see it updated here later if the new value is eventually moved to the stack, perhaps when the value is actually used. You can click on a line of text in the Stack Pane (third from the top) to select the value of an argument or local variable. Then (as usual in the IDE) you can invoke any command on the IDE's menu bar on the selected argument or variable value; this will do something if that command makes sense on that kind of value. Or right-click a value to see a pop-up menu of suggested commands for that kind of value. Or double-click a value to inspect it in the IDE's Inspector. As a debugging experiment, you can modify the value of an argument or local variable at any step, and then continue stepping with the replacement value. To do this, right-click the desired argument or variable and select Modify Argument or Variable from the pop-up menu. A modal dialog will then appear, where you can enter a lisp expression that will be evaluated to produce a replacement value for that argument or variable. You can then continue execution with the replacement value. When the Include Dead Locals check box is checked, as it is by default, then the Stack Pane displays all local variables. When it is unchecked, variables that are "dead" at the current step are excluded from the list. A dead variable is one whose current value will no longer be used as the execution of the current function proceeds (though it may later be set to another value that will be used). The form in the Definition Pane at which the stepper is currently stopped is drawn with a background color that can have different meanings. An explanatory note will appear in the dialog the first three times each highlighting color is used. When the highlighting is blue, this is simply the default highlighting color that is used when none of the special colors below are in effect. When the highlighting is green, it means that source-level debugging information is available for the function that the highlighted form will call. This is a "green light" that pressing the Step Into button will continue doing source-level stepping. The called function would then replace the calling function in the Definition Pane. When the highlighting is yellow, it means that you can do a Step Into to step through the function that is being called on that step, though no source debug info is known for the function that is being entered and so it will be stepped through at the assembly language level. So this is a yellow light to do a Step Into with caution. When that function call returns, the stepper should resume stepping that current function at the source code level. When the highlighting is orange, it means that you are stopped at a macro form. The next step may be affected by the current choice in the Macroexpansion Stepping Action group at the lower right of the stepper dialog. See the notes that are shown in the dialog's status bar as you move the mouse over those choices. When the highlighting is gray, it means that no source code range is known for the current step point. The previously-highlighted form remains highlighted simply as a general landmark. Typically the higlighted code will be a macro form that you are still somewhere inside, but execution may actually be at some point beyond the gray highlighted form. When the highlighting is purple, the highlighted form is a preview of a function call that will be made later, after its arguments are evaluated. To step into that function, you would first need to do more Next steps to evaluate the arguments. When the highlighting returns to this same form just before the call is really about to be made, it will be green or yellow to show that you can step into the function at that time. Whenever the Definition Pane at the top has the keyboard focus, each of the three panes that display information may be scrolled with the keyboard using the usual vertical scrolling keys (PageUp and PageDown, Home and End, and the up and down arrow keys). If no shift keys are held down, then the Definition Pane is scrolled. If the shift key is held down, the Form Pane is scrolled, and if the control key is held down, the Stack Pane is scrolled. Whenever execution stops at a step and the Stepper Dialog is selected, the keyboard focus is moved to the Definition Pane to facilitate scrolling the three content panes in this way. When either the Definition Pane or the Stack Pane has the keyboard focus, Search | Find Forward (from the IDE's menu bar) can be used to search the pane for an arbitrary string, and then Search | Find Again may be used to find subsequent matches. In the Definition Pane, Search | Find Forward will always start at the top of the definition. A string match will be highlighted with a light red background. In the Stack Pane, Search | Find Forward will always start at the top of the list. Only variable names are searched for string matches. A line with a matching variable name will be selected. Pressing the Tab key in either of these panes will move the keyboard focus to the other pane. A vertical gray bar is drawn just inside either of these pane's scrollbar when it has the focus. If breakpoints are added to functions for which source-level debugging information is not available, and the Stepper Dialog is present when the breakpoints are hit, the Stepper dialog will still display some information and allow stepping to be done. The Definition Pane will still display the function source if the usual "source file information" is available, but will not highlight forms for the current step because they are not known. The Form Pane will display an assembly language form rather than a lisp form. And the Stack Pane will still display local variable values. When changing this setting, existing breakpoints will still be stepped in the language that was current when those breakpoints were added. You would need to delete and re-add those breakpoints to use them with the newly-selected language. Over: step over this form or macroexpansion and to the next form. Across: step across the top levels of the current form. Out: step until the next outer macroexpansion is re-entered. Max-Level: a variant of :into which allows specifying how many levels of macroexpansion will be done. Further macro forms encountered will be stepped over and breakpoints in their macroexpansion will not be seen. Running the mouse cursor ove rthe choices displays documentation in the dialog status bar at the bottom of the dialog. The top-level command :help step typed to a Listener prompt will also provide documentation. The dialog has two split-bar widgets for adjusting the relative size of the three content panes. When the resizing mouse cursor appears as you move the mouse between the panes, click and drag to adjust the sizes.